The new fork of bfgminer with support for ZeusMiner’s Scrypt ASICs (Litecointalk development topic) that we have told you about a few days ago is seeing some nice development. The fork that is compatible with ZeusMiner, GAWMiners and Hashra Zeus-based Scrypt ASICs has been updated to bfgminer 4.2.1 and the driver has been reworked a bit including some changes to the command line options that are no longer the same as the initial cgminer release with support for ZeusMiner ASICs. The latest release even has an option to “override” the maximum frequency of 382 MHz that the ZeusMiner ASICs are apparently limited to, however this only overrides the software check, but does not actually make the miner work at higher frequency (the 382 MHz maximum might be a hardware limitation). Also do note that there might be some issues running multiple miners in a single instance, so you might need to run 5 or more units in a single miner per instance of bfgminer configuration. 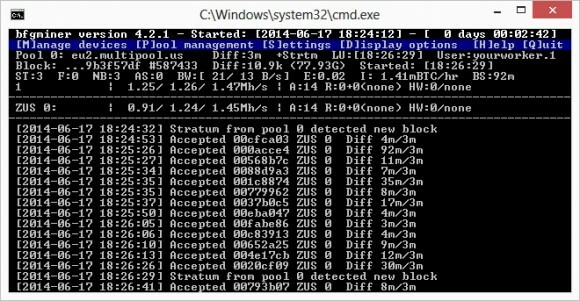 Below you can find a windows binary of the bfgminer 4.2.1 that you can try, just make sure to set the right number of chips depending on your miner model as well as the virtual COM port at which the miner is detected. The recommended operating frequency still seems to be 328 MHz for most people as a good balance in terms of performance and HW error rate, though you are welcome to play with it.